The love between mother and child is forever. How nice to catch it in a silver jewelry. KAYA has a large collection graveerbedels where you can engrave the names of your children. Hang them on the jasseronarmband, so you have a wonderful mother ornament to proudly carry with you and keep it forever. The trendy silver jasseron bracelet is 19cm, entirely of sterling silver. The links this bracelet is particularly suitable for our name with charms carabiner. 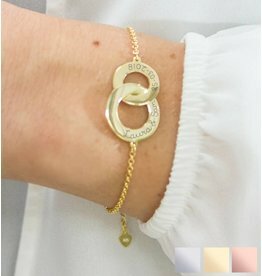 You hook the name as charms to the bracelet! And through the open links can also, if required, to adjust the length. The bracelet is packaged in a luxury jewelry box. Heart-shaped charms with one name, animals, constellations or four names graveerbedels. The choice is enormous. By carabiner this charm is easy to attach to a bracelet or necklace. Enter by your desired names and we'll do the rest. Mama's love jewelry, you can carry them with you and show how proud she is of her kids. Give her a charm bracelet with a base, and expand this increasingly out at special moments. Superb for a special occasion, like mom's birthday, Mother's Day or on other special celebration.